This is the Mushroom Softies pattern from Amigurumi Two by Ana Paula Rimoli, one of the books Justin bought me for my birthday. 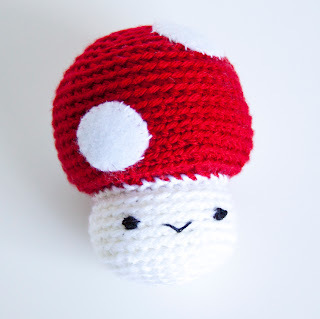 When I showed my sister the book, this was the pattern she commented about most - she loves Mario style mushrooms. She even made big mushroom top hats for herself and her husband one year for Halloween. Add my nephew's love of the color red to the family's mushroom obsession and this baby was meant to be. I used Everyday Soft Worsted yarn in Really Red and Snow White along with white and black felt and embroidery floss. Luckily I had all the items I needed on hand. Since I knew this was going to my nephew (who loves to chew my crocheted toys), I cut out teeny tiny circles of felt for the eyes and sewed them on. Confession: I originally tried to embroider satin stitch eyes - they looked awful. It's very difficult to embroider an even shape on a bumpy surface. So I just put the felt over the bad looking embroidered eyes - victory! 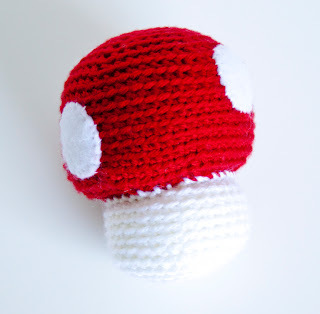 The only thing that bugs me about using the 4 white felt pieces on the mushroom top is that the red yarn left red fuzz on the embroidery floss as I pulled it through, so it's a little red at the stitches. Hopefully that eventually wears off with excessive chewing. I think this pattern is cute, but it's very difficult to keep it the shape shown in the book once you stuff it. I like that you can choose which size mushroom you want (there are directions for small, medium and large), the final "put everything together" stage could be described a little better. I think I stuffed my top too much because it just won't curl over the base like the example photo does. Oh well, I still think it's super cute. Also, I have an ace in the hole for this to be an extremely successful toy for my nephew.